Albumine aussi bien que PFC ? J Trauma Acute Care Surg. 2016 Apr 27. Kheirabadi BS et Al. Plasma infusion with or without RBC is the current military standard of care for prehospital resuscitation of combat casualties. We examined possible advantages of early and limited resuscitation with fresh plasma compared with a single plasma protein or crystalloid solutions in an uncontrolled hemorrhage model in rabbits. Anesthetized spontaneously breathing rabbits (3.3±0.1 kg) were instrumented and subjected to a splenic uncontrolled hemorrhage. Rabbits in shock were resuscitated at 15 min with Plasma-Lyte (PAL; 30 ml/kg), PAL+ fibrinogen (PAL+F; 30ml+100mg/kg), fresh rabbit plasma (PLS; 15ml/kg), or 25% albumin (ALB; 5 ml/kg) solution; all given in two bolus IV injections (15 min apart) to achieve a MAP of 65 mmHg, n=8-9/group. Animals were monitored for 2 hrs or until death and blood loss was measured. Blood samples and tissues were collected and analyzed. There were no differences among groups in baseline measures and their initial bleeding volume at 15 min. 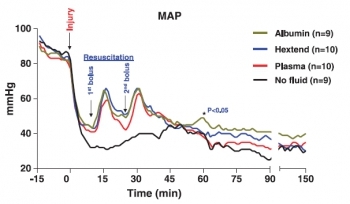 At 60 min post-injury, MAP was higher with albumin than with crystalloids (PAL or PAL+F), but shock indices were not different despite the large differences in resuscitation volumes. Fibrinogen addition to PAL only increased clot strength. Plasma resuscitation increased survival rate (75%) without significant improvement in coagulation measures. Albumin administration replenished total plasma protein, and increased survival rate to 100% (p<.05 vs. crystalloids). No histological adverse events were identified in the vital organs. HES et hémorragie: Pas bon ménage ? Un travail de plus qui doit rendre raisonné sur l'emploi des colloïdes synthétiques qui si ils semblent préserver la circulation splanchnique seraient responsables de lésions oxydatives secondaires. CEla serait moins le cas avce le salé hypertonique. Introduction: Fluid resuscitation is an indispensable procedure in the acute management of hemorrhagic shock for restoring tissue perfusion, particularly microcirculation in splanchnic organs. 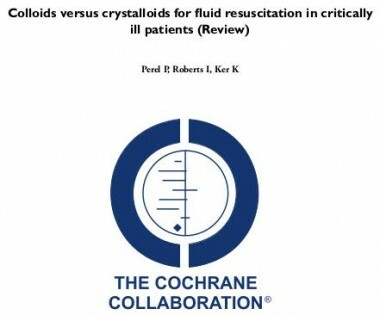 Resuscitation fluids include crystalloids, hypertonic saline (HTS), and synthetic colloids, and their selection affects the recovery of microcirculatory blood flow and reactive oxygen species (ROS) formation, which is often evident in the kidney, following reperfusion. 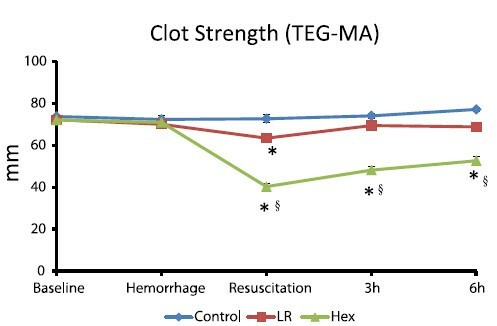 In this study, the effects of acute resuscitation with 0.9 % saline (NS), 3 % HTS, 4 % succinylated gelatin (GEL), and 6 % hydroxyethyl starch (HES) 130/0.4 were compared in a hemorrhagic shock rat model to analyze restoration of microcirculation among various splanchnic organs and the gracilis muscle and reperfusion-induced renal ROS formation. Methods: A total of 96 male Wistar rats were subjected to sham operation (sham group), hemorrhagic shock (control group), and resuscitation with NS, HTS, GEL and HES. Two hours after resuscitation, changes in the mean arterial pressure (MAP), serum lactate level and the microcirculatory blood flow among various splanchnic organs, namely the liver, kidney, and intestine (mucosa, serosal muscular layer, and Peyer’s patch), and the gracilis muscle, were compared using laser speckle contrast imaging. Renal ROS formation after reperfusion was investigated using an enhanced in vivo chemiluminescence (CL) method. Results: Microcirculatory blood flow was less severely affected by hemorrhaging in the liver and gracilis muscle. Impairment of microcirculation in the kidney was restored in all resuscitation groups. Resuscitation in the NS group failed to restore intestinal microcirculation. Resuscitation in the HTS, GEL, and HES groups restored intestinal microcirculatory blood flow. By comparison, fluid resuscitation restored hemorrhagic shock-induced hypotension and decreased lactatemia in all resuscitation groups. Reperfusion-induced in vivo renal ROS formation was significantly higher in the GEL and HES groups than in the other groups. Conclusion: Although fluid resuscitation with NS restored the MAP and decreased lactatemia following hemorrhagic shock, intestinal microcirculation was restored only by other volume expanders, namely 3 % HTS, GEL, and HES. However, reperfusion-induced renal ROS formation was significantly higher when synthetic colloids were used. Lent/régulier: Mieux pour le crâne ? Optimal fluid resuscitation strategy following combined traumatic brain injury (TBI) and hemorrhagic shock (HS) remain controversial and the effect of resuscitation infusion speed on outcome is not well known. We have previously reported that bolus infusion of fresh frozen plasma (FFP) protects the brain compared with bolus infusion of 0.9% normal saline (NS). We now hypothesize reducing resuscitationinfusion speed through a stepwise infusion speed increment protocol using either FFP or NS would provide neuroprotection compared with a highspeed resuscitation protocol. 23 Yorkshire swine underwent a protocol of computer controlled TBI and 40% hemorrhage. Animals were left in shock (mean arterial pressure of 35 mmHg) for two hours prior to resuscitation with bolus FFP (n = 5, 50 ml/min) or stepwise infusion speed increment FFP (n = 6), bolus NS (n = 5, 165 ml/min) or stepwise infusion speed increment NS (n = 7). Hemodynamic variables over a 6-hour observation phase were recorded. Following euthanasia, brains were harvested and lesion size as well as brain swelling was measured. Bolus FFP resuscitation resulted in greater brain swelling (22.36 ± 1.03% vs. 15.58 ± 2.52%, p = 0.04), but similar lesion size compared with stepwise resuscitation. This was associated with a lower cardiac output (CO: 4.81 ± 1.50 l/min vs. 5.45 ± 1.14 l/min, p = 0.03). In the NS groups, bolus infusion resulted in both increased brain swelling (37.24 ± 1.63% vs. 26.74 ± 1.33%, p = 0.05) as well as lesion size (3285.44 ± 130.81 mm(3) vs. 2509.41 ± 297.44 mm3, p = 0.04). This was also associated with decreased cardiac output (NS: 4.37 ± 0.12 l/min vs. 6.35 ± 0.10 l/min, p < 0.01). In this clinically relevant model of combined TBI and HS, stepwise resuscitation protected the brain compared with bolusresuscitation. Analysis of combat deaths provides invaluable epidemiologic and quality-improvement data for trauma centers and is particularly important under rapidly evolving battlefield conditions. 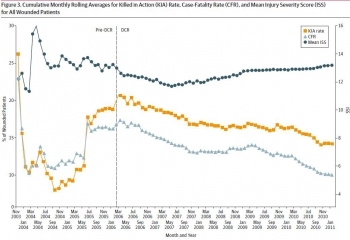 To analyze the evolution of injury patterns, early care, and resuscitation among patients who subsequently died in the hospital, before and after implementation of damage control resuscitation (DCR) policies. In a review of the Joint Theater Trauma Registry (2002-2011) of US forward combat hospitals, cohorts of patients with vital signs at presentation and subsequent in-hospital death were grouped into 2 time periods: pre-DCR (before 2006) and DCR (2006-2011). Injury types and Injury Severity Scores (ISSs), timing and location of death, and initial (24-hour) and total volume of blood products and fluid administered. Of 57 179 soldiers admitted to a forward combat hospital, 2565 (4.5%) subsequently died in the hospital. The majority of patients (74%) were severely injured (ISS > 15), and 80% died within 24 hours of admission. Damage control resuscitation policies were widely implemented by 2006 and resulted in a decrease in mean 24-hour crystalloid infusion volume (6.1-3.2 L) and increased fresh frozen plasma use (3.2-10.1 U) (both P < .05) in this population. The mean packed red blood cells to fresh frozen plasma ratio changed from 2.6:1 during the pre-DCR period to 1.4:1 during the DCR period (P < .01). There was a significant increase in mean ISS between cohorts (pre-DCR ISS = 23 vs DCR ISS = 27; P < .05) and a marked shift in injury patterns favoring more severe head trauma in the DCR cohort. Hypersalé: Mieux avec de la lidocaïne , du magnésium et de l'adénosine ? La prévention/correction de la coagulopathie traumatique est un axe essentiel de la réanimation du traumatisé grave. Le choix du soluté a son importance. L'adjonction de lidocaïne, de magnésium et d'adénosine au NaCl7,5% serait bénéfique. On observerait une fibrinolyse beaucoup moins importante qu'avec le salé hypertonique seul. BACKGROUND: Acute traumatic coagulopathy is a major contributor to mortality and morbidity following hemorrhagic shock. 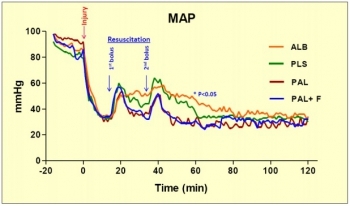 Our aim was to examine the effect of small-volume 7.5% NaCl with adenosine, lidocaine, and Mg2+ (ALM) resuscitation on the timing of correction of coagulopathy in the rat model of severe hemorrhagic shock using ROTEM. METHODS: Male rats (300Y450 g, n = 64) were randomly assigned to (1) baseline, (2) sham, (3) bleed, (4) shock, (5) 7.5% NaCl for 5 minutes, (6) 7.5% NaCl with ALM for 5 minutes, (7) 7.5% NaCl for 60 minutes, or (8) 7.5% NaCl with ALM for 60 minutes (all n = 8). 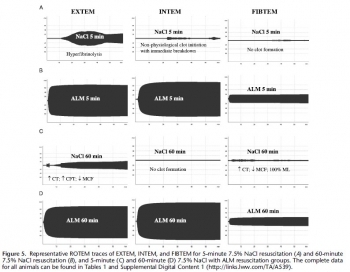 For resuscitation, 0.3-mL intravenous bolus of 7.5% NaCl was administered with and without ALM (n = 8 each group). Hemodynamics and coagulopathy were assessed. RESULTS: After hemorrhage, prothrombin time (PT) and activated partial thromboplastin time (aPTT) increased approximately four to six times, and ROTEM indicated hypocoagulopathy. After 60-minute shock, no sustainable clots could form. 7.5% NaCl increased mean arterial pressure (MAP) to 46 T 2 mm Hg at 5 minutes and generated a weak clot in EXTEM with hyperfibrinolysis in all tests. At 60 minutes, 7.5% NaCl failed to sustain MAP (43 T 5 mm Hg) and generate a viable clot. In direct contrast, 7.5% NaCl with ALM at 5 minutes resuscitatedMAP to 64 T 3 mm Hg, corrected PT and aPTT, and generated fully formed EXTEM and FIBTEM clots. At 60 minutes, MAP was 69 T 5 mm Hg, PT and aPTT were fully corrected, and > angle, clot amplitudes (A10, A30), as well as clot firmness and elasticity were not significantly different from baseline. ALM clot lysis at 60 minutes was significantly less than bleed, shock, or 7.5% NaCl, indicating protection against hyperfibrinolysis. Salé, HEA, Plasma ou albumine ? La recherche de la meilleure stratégie de remplissage vasculaire pour la prise en charge d'un traumatisé sévère relève de la quête du saint-Graal. L'article proposé rapporte un travail expérimental qui semble trouver in intérêt réel à l'emploi d'albumine 4%. BACKGROUND: The purpose of this study was to test the hypothesis that a single bolus of 6% hydroxyethyl starch (HES 450/0.7 in lactated electrolyte injection) during initial resuscitation has a differential effect in blunt and penetrating trauma patients. METHODS: Consecutive admissions to the trauma service were reviewed. Patients who died within 24 hours were excluded. Multivariate analysis defined individual predictors for the primary outcomes, acute kidney injury (AKI) and mortality within 90 days. Data were expressed as mean T SD, and significance was assessed at p G 0.05.
trauma (OR, 0.90; 95% CI, 0.23-3.60; AUROC, 0.849). In separate logistic regression models, HES was a significant predictor of mortality after blunt trauma (OR, 3.77; 95% CI, 0.91-0.97; AUROC, 0.921) but not penetrating trauma (OR, 0.72; 95% CI, 0.13-3.94; AUROC, 0.904). 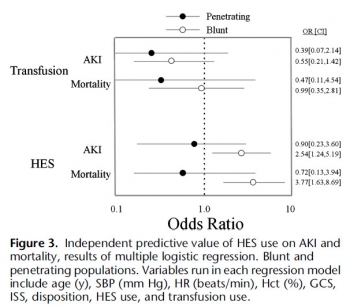 CONCLUSION: HES is an independent risk factor for AKI and death after blunt, but not penetrating, trauma, which underscores a fundamental difference between these two injury types. HEA: Peut être un peu de sérénité ? Weiskopf R. Anesth Analg. 2014 Sep;119(3):509-13. Un débat moins passionné est en train de se mettre en place au sujet de la toxicité des HES. Le texte proposé en est un exemple. Il propose une relecture pertinente des études 6S, CHEST et surtout CRISTAL qui d'une certaine façon remet en question les deux précédentes. Il nous demande de prendre en compte plusieurs éléments : La diversité des HES, les différences qui peuvent exister entre une administration répétée en réanimation et une administration ponctuelle péri-opératoire. Il s'appuie sur deux écrits publiés dans le même numéro. Raghunathan K et all. (Intravenous Starches: Is Suspension the Best Solution?) suggèrent que les solutions colloïdes sont à réserver pour les hypovolémies aiguës alors que Irwin et all. (Volume Therapy with Hydroxyethyl Starches: Are We Throwing the Anesthesia Baby Out with the Intensive Care Unit Bathwater?) estiment que le recours aux HES 130/0.4 est pleinement justifié en environnement périopératoire.
" Les solutions à base d’HEA peuvent être utilisées pour la réanimation des patients avec une hypovolémie causée par une perte aiguë de sang, quand les alternatives comme la perfusion de cristalloïdes seuls sont insuffisantes. Afin de limiter les risques potentiels, les solutions contenant des HEA ne devront pas être utilisées plus de 24 heures et la fonction rénale devra être monitorée après administration des HEA "
L'emploi préhospitalier de la transfusion de globules rouges et de plasma était évoqué de manière anecdotique. Une évolution importante survient dans la procédure américaine du TCCC (1, 2). Cette pratique est en passe de devenir une recommandation protocolée de théâtre pour les blessés en état de choc (Pas de pouls radial et conscience altérée el l'absence de traumatisme crânien) hémorragique avec notons le recours au Plyo du CTSA. - No IV fluids are immediately necessary. - Fluids by mouth are permissible if the casualty is conscious and can swallow. - Reassess the casualty after each unit. Continue resuscitation until a palpable radial pulse, improved mental status or systolic BP of 80-90 mmHg is present. - Continue resuscitation until a palpable radial pulse, improved mental status, or systolic BP of 80-90 mmHg is present. above end points has been achieved. There is no evidence from randomised controlled trials that resuscitation using colloids compared with crystalloids reduces the risk of death in patients with trauma, burns or following surgery. The use of hydroxyethyl starch might even increase mortality. 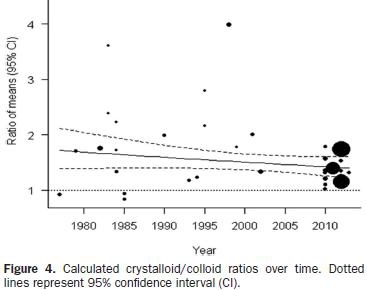 Since colloid use is not associated with improved survival and colloids are considerably more expensive than crystalloids, it is hard to see how their continued use in clinical practice can be justified. In critically ill patients requiring acute volume resuscitation, use of hydroxyethyl starch compared with other resuscitation solutions was not associated with a decrease in mortality. Moreover, after exclusion of 7 trials performed by an investigator whose research has been retracted because of scientific misconduct, hydroxyethyl starch was associated with a significant increased risk of mortality and acute kidney injury. Clinical use of hydroxyethyl starch for acute volume resuscitation is not warranted due to serious safety concerns. Pour la coagulation: HEA de haut PM pas bon ? 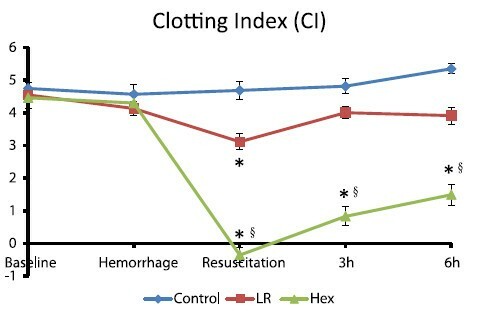 After traumatic hemorrhage, coagulation function was restored within 6 hours with LR resuscitation but not with Hextend. 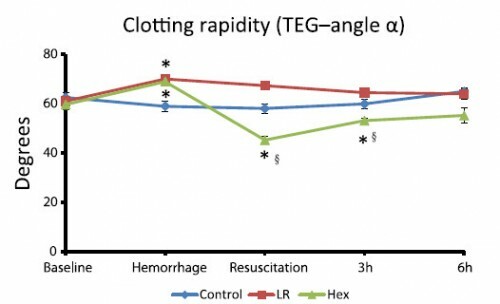 The lack of recovery after Hextend is likely caused by greater hemodilution and possible effects of starches on coagulation substrates and further documents the need to restrict the use of high-molecular-weight starch in resuscitation fluids for bleeding casualties. On rappelle que l'Hextend est un HEA 670/0.75 et que le voluven est un HEA 130/0,4 dont les effets sur la coagulation sont réputées étant moindres.